Have you ever heard of a living creature called pygmy seahorse? It is very tiny seahorse which has only recently been discovered. It was difficult to spot due to its mimicry capability and small size. 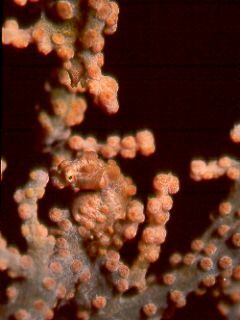 The classification of Pygmy seahorse is still being debated, but it is a member of the seahorse family. Any seahorse with a length of about 20mm is called pygmy sea horse. Therefore, there is not a regular classification called pygmy seahorse. It is said that pygmy sea horse has many place witch were just discovered in 1999 years and have not been discovered yet. Therefore, specification of distribution is not yet understood. As a known place,they are temperate areas and tropical areas, such as South America and Africa,globally. Pygmy sea horse is seen in Japan in Kashiwajima, Hachijozima, Okinawa, Kishuu, Izu, etc. Since pygmy sea horse seen in Japan differs in appearance, it is called Japanese pygmy seahorse. Pygmy sea horse is new! Therefore, for a diver, it is extremely popular. Of course, a diver trade association will profit, if the diving position which pygmy seahorse inhabits is known. Then, scramble of pygmy sea horse is carried out. This is actual to an ashamed thing in Japan. Argument does not cease between diver contractors or among communities by that. In order to prevent these, the statute which does not break the ecology of pygmy sea horse is required. For that purpose, it must be indicated as a new species. The place where pygmy sea horse is seen in Kochi is kashiwazima. Kashiwajima is a place where tides, such as the Japan Current, collide, and it is famous for the four seasons in the sea. Much coral which colors the sea is the highlights. The kind of fish gathering in kashiwazima drops to 1/3 of whole Japan. How about searching, when diving by Kashiwajima? You can see pygmy sea horse, if you have diving ability. I want to watch this mysterious creature.